Today I have gone through a book Practical Electronics for Inventors written by Paul Scherz, which describes the various practical circuit ideas and designing techniques.Its 585 page big book with all basic ideas related to electronics. I am reviewing and recommending this book here,because I am getting tons of comments from newbies in electronics asking where to start,what to study, how to etc. As we all know, Electronics is a “SEA” of knowledge which cant be drunk in a day. You really need to go through some books that gives you some basic knowledge of the industry and science. I recommend this book to all guys who are new to Electronics world and really interested in knowing what it is? I want to download this book.Please,how to download this book? Hi zinkokoaung, You cannot download the soft copy of the book. But you can buy the hard copy of the book online by clicking on the link and you can receive it in your billing address. Loooks like a gr8 book. 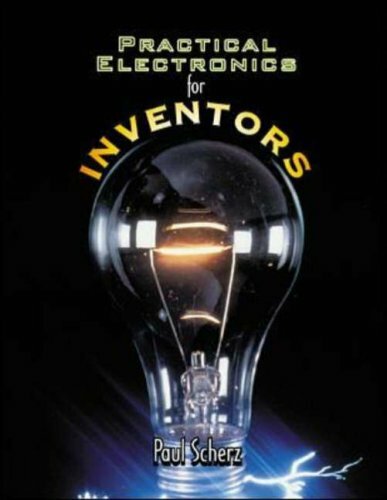 Practical Electronics for Inventors is the name of the book. i should really love to have a copy of the book and read it. The amount is not too much for me but how to make the payment and the assurance of having when paid is where my problem lies. How can i make it through this? A great book for electronic students. i am Ali Raza From University of The Punjab(Eectrical Engineering Department)….very Great Book for all Student and also For Hobiest…!! i am a faruk hosain. i like your books and want to download it.